As the next deadline for the Florida dealer license renewal approaches, some dealers may be wondering what it is they need to do. To comply with state requirements wholesale motor vehicle dealers, independent motor vehicle dealers, salvage motor vehicle dealers and motor vehicle auction licensees must renew their license before May 1! Along with their license, they will also need to renew their Florida auto dealer bond. 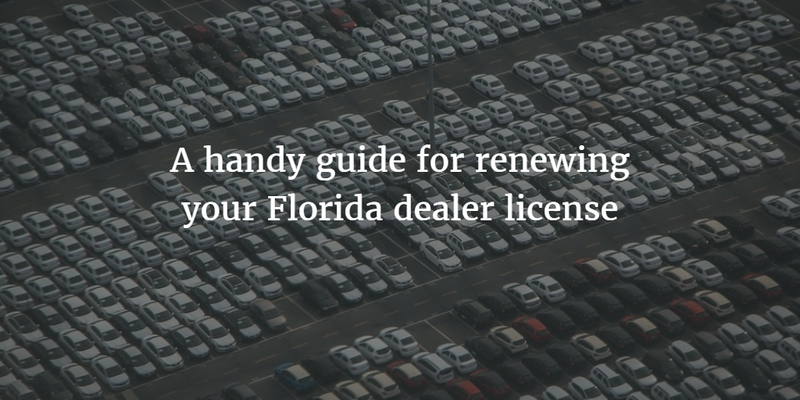 Read on for a breakdown of all the steps that Florida dealers must complete to renew their license. Who must renew their license and when? Keep in mind that there are other dealer license types in Florida. These do not expire on April 30. You can see the renewal schedule for all types of dealer licenses in Florida here. All types of dealers must complete the HSMV 86720 renewal application form. This includes providing standard information regarding yourself and your dealership, and proof of acceptable identification. Along with your application, you will need to submit copies of your garage liability insurance. Your insurance policy must include a minimum of $10,000 for personal injury protection and a $25,000 combined single limit liability coverage which must include bodily injury and property damage protection. Alternatively, you may choose to submit a general liability insurance in the exact same amounts. Either policy must be signed by your insurance agent. Salvage motor vehicle dealers are exempt from this requirement by law. You must obtain and submit a copy of your certification from the Florida Division of Corporations. This certification must include information regarding your business’s current registration at the Division and any fictitious name(s) of your business. Dealers must provide a certificate of having completed a dealer license continuing education course at a licensed dealer training school in Florida. Independent motor vehicle dealers are also given the option to complete a pre-licensing dealer training seminar. Applicants for one of the said licenses who renew their license before May 1, must pay a $75 renewal fee for a one-year renewal. A biennial renewal is also possible against a $150 fee. If the renewal application along with all documents for a dealer’s primary location are not received by April 30 by the DHSMV, applicants are required to pay a $100 delinquent fee on top of their normal renewal fee. This ‘delinquent period’ continues for 45 days after the renewal deadline. If the delinquent period is also missed by the dealer, he or she must start the licensing process all over again and cannot renew their old license. Florida car dealers are required to obtain a $25,000 Florida auto dealer bond upon getting their license. They must renew this bond every time they renew their license as well. Renewing the bond requires that you pay a renewal premium to your surety bond company in order to remain bonded. The amount of your premium depends on a number of factors. See below for more information regarding your surety bond cost. Dealers who have supplemental locations must submit the same documents that they submitted for their primary location for their supplemental location. This means that you need to submit the same copy of your insurance policy and surety bond, rather than having to obtain to insurances or bonds. You must also submit an additional Florida dealer license renewal form. An additional renewal fee is due, though! A yearly renewal fee of $50 or a biennial renewal fee of $100 must be paid to the DHSMV for every supplemental location. How much does the bond renewal cost? The cost of your Florida auto dealer bond is a percentage of the full $25,000 bond amount. This percentage is determined by sureties when you apply for your bond, and is based on their estimation of your financial stability. Your personal credit score plays an important role in that assessment. Typically, applicants with a high credit score can expect to have to pay a rate that is between 1% and 3% of the total bond amount. Applicants with lower credit can get bonded too, though, though rates under our bad credit program are slightly higher. Following the above steps is really all you need to complete your Florida dealer license renewal. If you have any questions regarding the bonding requirements for auto dealers in Florida or want to know more about bonds, give us a call at (877)-514-5146! To get your car dealer bond, just fill in our online bond renewal application and we’ll take care of the rest! We will shortly contact you with your free quote on your bond. Alabama Auto Dealer License and Bond Renewal Coming Up!